Our hotel in Cusco is perched on such a narrow, steep street that our taxi driver is refusing to drive down to it. 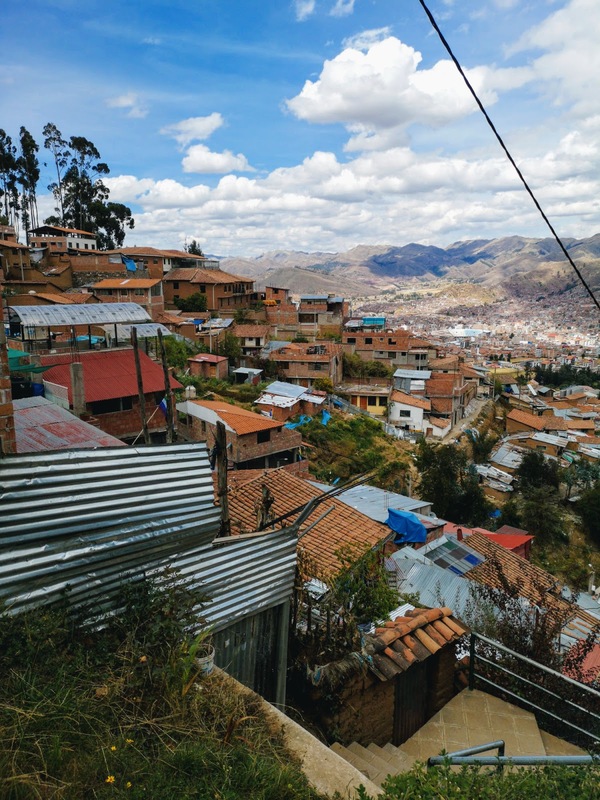 "We can't drive down that road, I'll leave you at the top," he tells us, although when we reach the road's peak and spot another taxi that's dared to make the perilous descent, he sheepishly shifts into a lower gear and pursues. We climb out onto cobbled streets and haul our bags from the boot and along a narrow walkway to the entrance of the hotel. All around us, white walls rise up and narrow the slice of bright blue Cusqueño sky above us. As we step into the hotel's picturesque courtyard, the world unfolds a little - tables and chairs invite guests to spend a while amongst the pretty gardens, beneath a canopy of that blue. 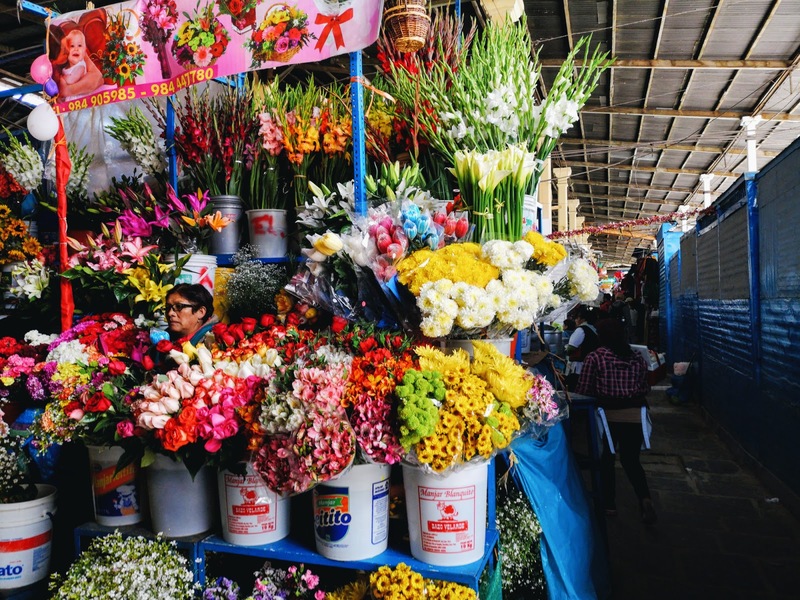 We notice some murals of flowers in bold primary colours snaking up walls and across doorways. Then we step inside. If we didn't know where the hotel's name came from before, then we certainly do now. 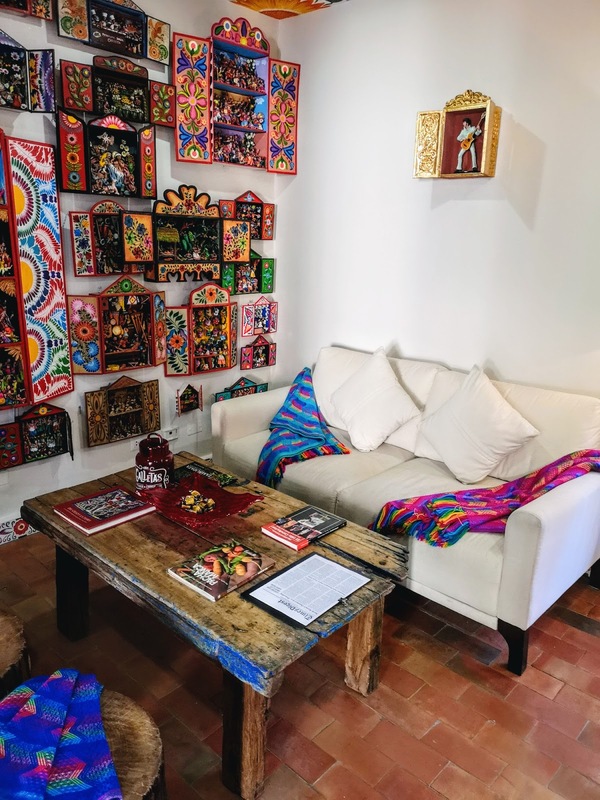 The reception of El Retablo, our glorious boutique bolthole for the next few nights, almost looks like it has been constructed from these traditional Peruvian works of art. Retablos can only be described as boxes of artistic ingenuity; their wooden doors open to reveal highly intricate scenes which have been carved from wood and lovingly brought to life with all the colours of the rainbow. Our hotel has been booked for us by Mountain Lodges of Peru (MLP) who will be in charge of our honeymoon for the next nine days as we set off on an epic trek over the Salkantay Pass towards Machu Picchu. 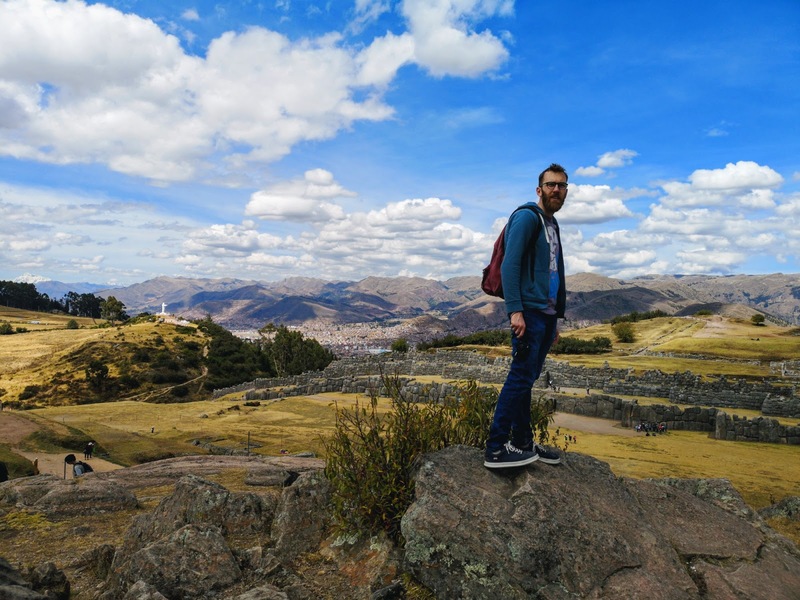 Before that though, we've got a few days to while away in Cusco, whilst we finish acclimatising in preparation for our demanding hike. Needless to say, our first impressions of MLP are rather positive and they only improve when we are shown to our room. 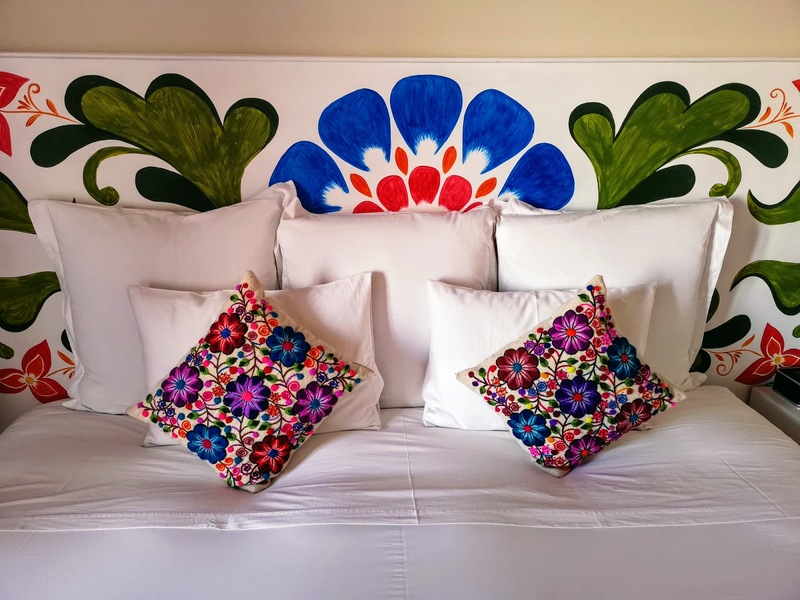 The same floral motifs that adorned the courtyard have found their way into our sleeping space, where clean white walls and sheets contrast with shouts of Peruvian colour. The bed is giant and luxuriously comfortable. 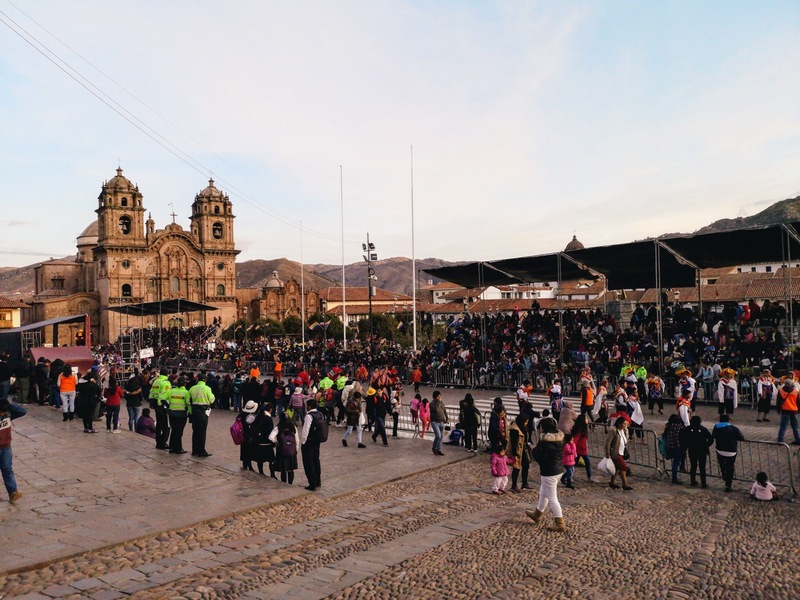 When we push the shutters open, the whole of Cusco tumbles out before us, with the mountains frosting the horizon. There's that sky. 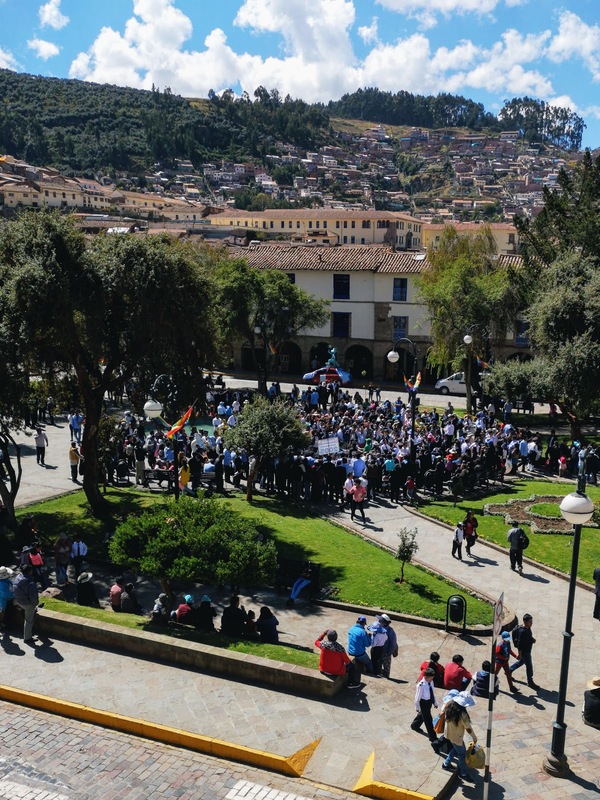 The mood in Cusco is one of celebration for the duration of our entire stay. 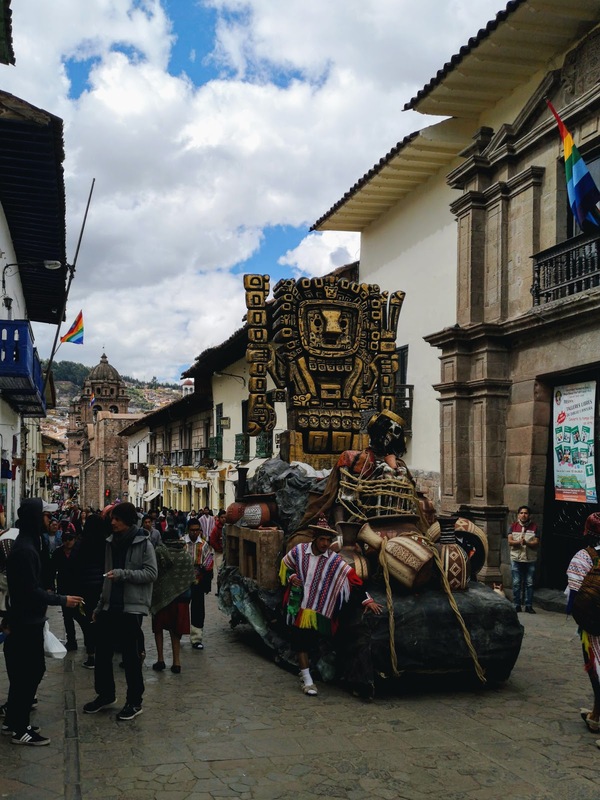 Not only are Peru excelling in the World Cup (although sadly we know how that one ended), but the month of June is given over to festivities in Cusco, with the famous Inti Raymi Festival of the Sun falling on the 24th. 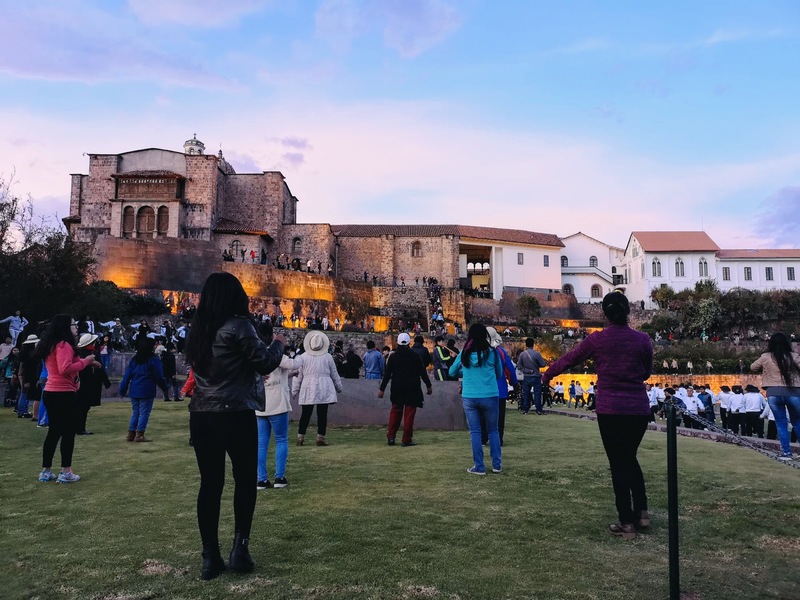 On the first night, we trundle down to the central Plaza de Armas to find a parade of people dancing energetically in brightly coloured costumes. Their joy and exuberance are a million miles away from the sad shuffling of the people on Taquile Island. 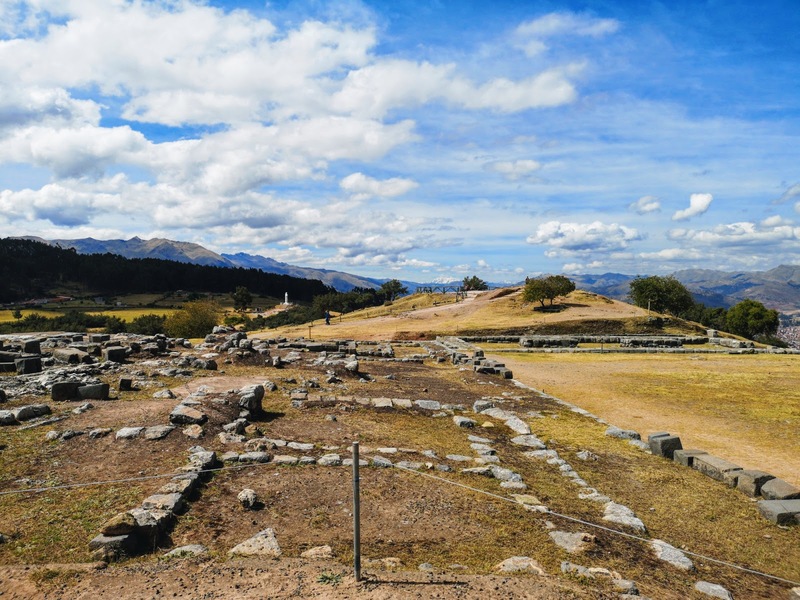 The next morning, we hike back up the road to Sacsayhuamán (and boy oh boy, there's nothing quite like altitude to make you feel unfit), where Inca ruins sit within reasonable walking distance from the city centre. We head straight for the viewpoint and observe the entirety of the city stretched out before us, an even tinier miniature than the one we can see from our hotel room. 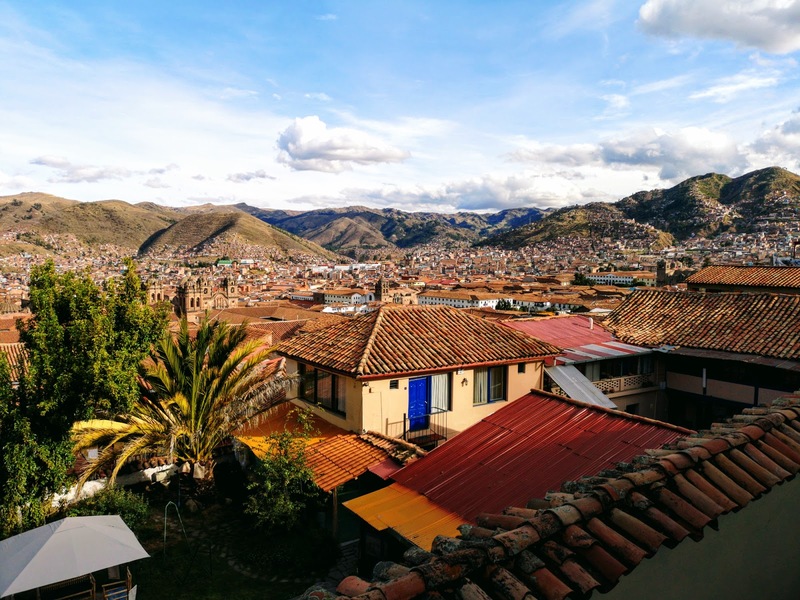 Sounds lift from the roofs of Cusco, made soft by the distance. Cheers, applause, horns. Peru is playing in the World Cup today. 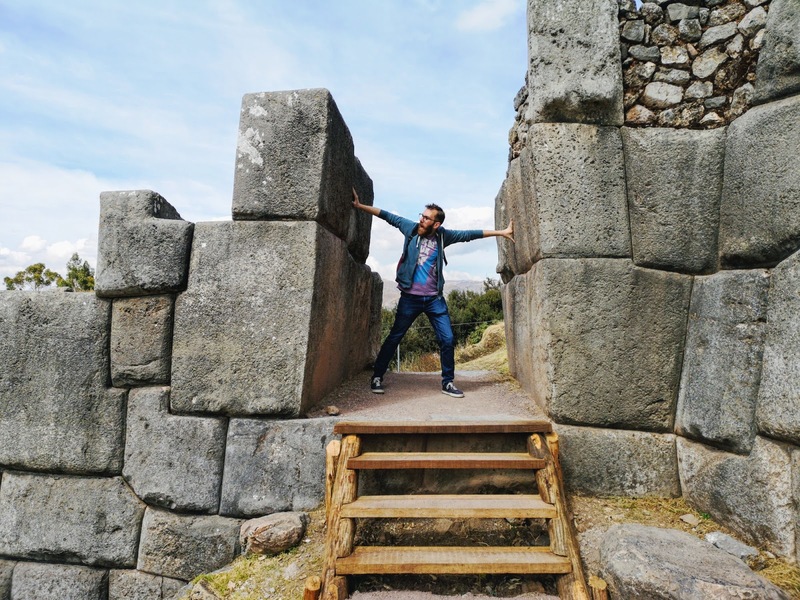 Walking around the rest of the Inca ruins, we climb up walls, pass through gaps in the stone and observe the landscape drop and rise around us. We follow a path that cuts a corridor through the rock and seems to wind down under the ground into acute darkness (I rush back out into the light whilst Michele continues to explore the subterranean world). We contemplate the impossibility of the stones of the ruins, the way they have been cut to fit each other so perfectly. In the distance, a large white Jesus statue blesses the city below. On our way back down to the centre, we take the steep stairways that cut through the houses that cling so precariously to the hillside. 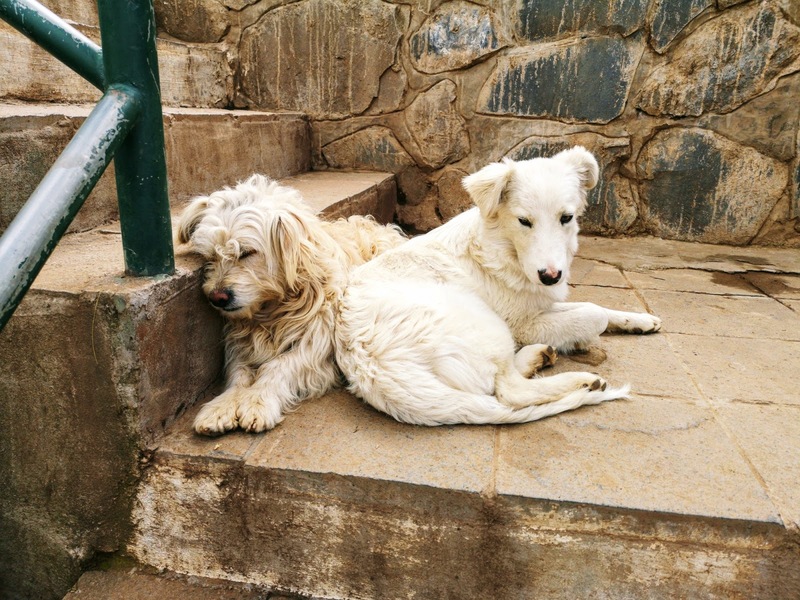 It seems that this is where the majority of the dogs live; every twist and turn of the path finds another pack of them, lazing in the sunshine or following their noses along a scent trail. It is hard to know whether they are strays or whether they belong to the houses; a couple of terriers certainly get very territorial as we try passing a particular row of houses and we only just manage to avoid having our ankles nibbled. Our days spent in the city are days spent in the midst of constant festival. There are parades in the street, impressive sculptures toted around on floats, and bands of people dancing together and playing music in what appears to our naive eyes to be spontaneous eruptions of union and song. Brass bands march around the streets, flags are waved; we are treated to a particularly fortuitous view of one such street party from the balcony of the ChocoMuseo where we sip hot chocolate in the cool sunshine. 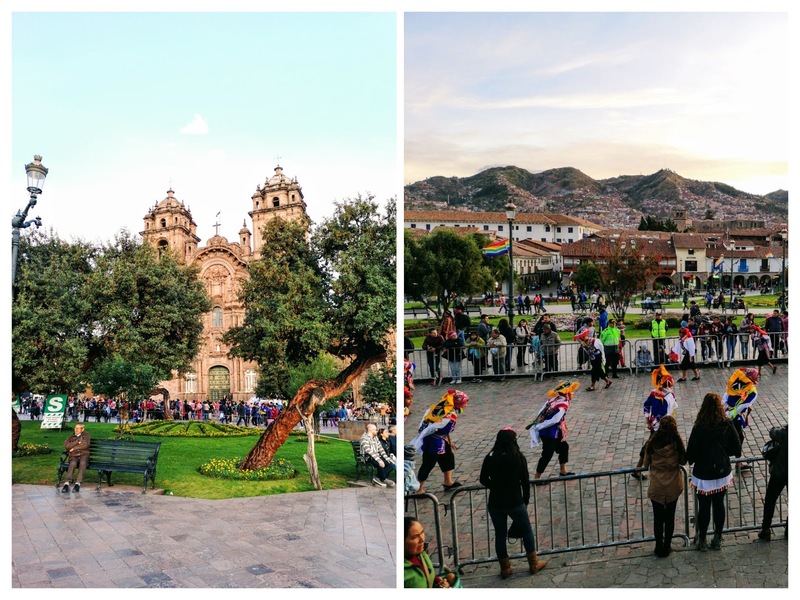 There is something about Cusco that feels adventurous and exciting. Perhaps it is the upcoming hike, looming like the mountains on the horizon. Perhaps it is the joy that flows through the streets with the parties and parades. 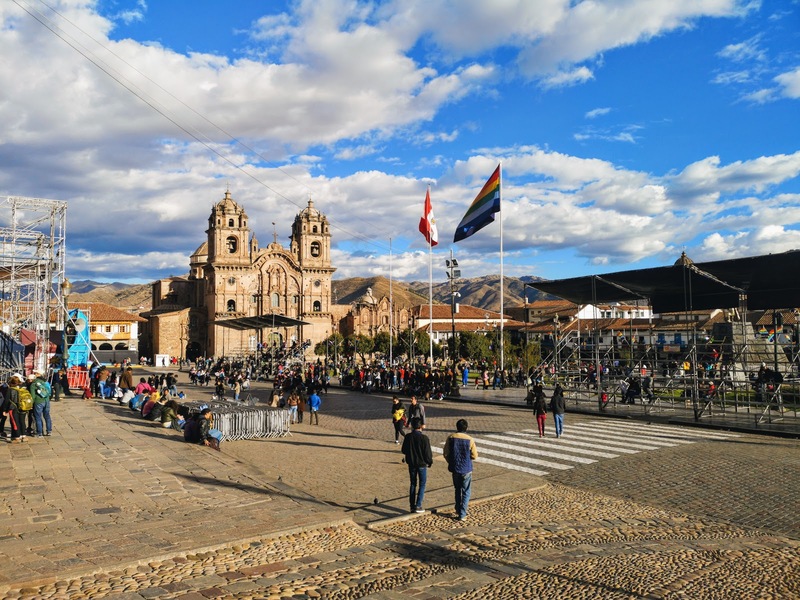 Michele thinks it's because Cusco is easier for us to understand compared to the intimidating sprawl of Lima - it has a clear central point with a myriad of roads festooned with shops and restaurants that snake outwards from the city's heart. It's closer to a European city, he says. But that's not entirely true. 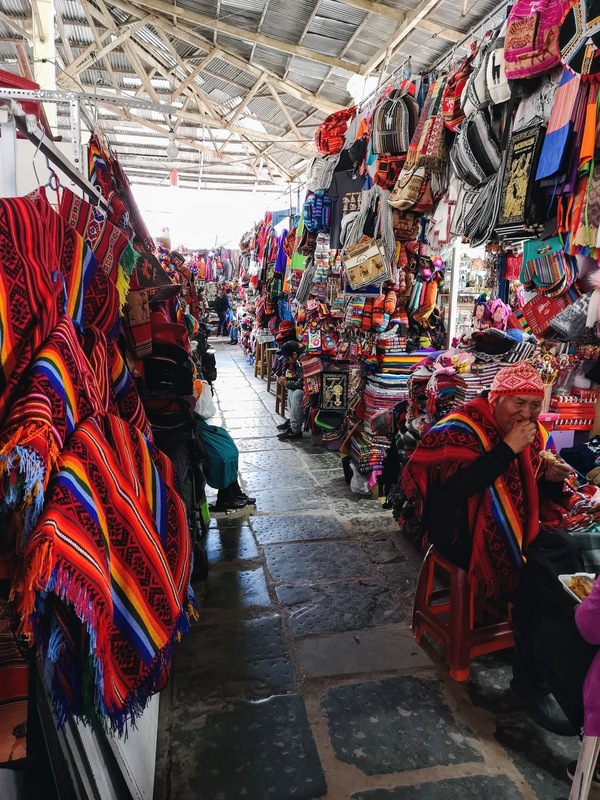 Although the influence of European colonialists cannot be denied, Cusco also has an identity that is a million miles from home. This can be particularly felt in the San Pedro market. We visit on a quiet day when most of the stalls are closed but the experience is still slightly overwhelming. 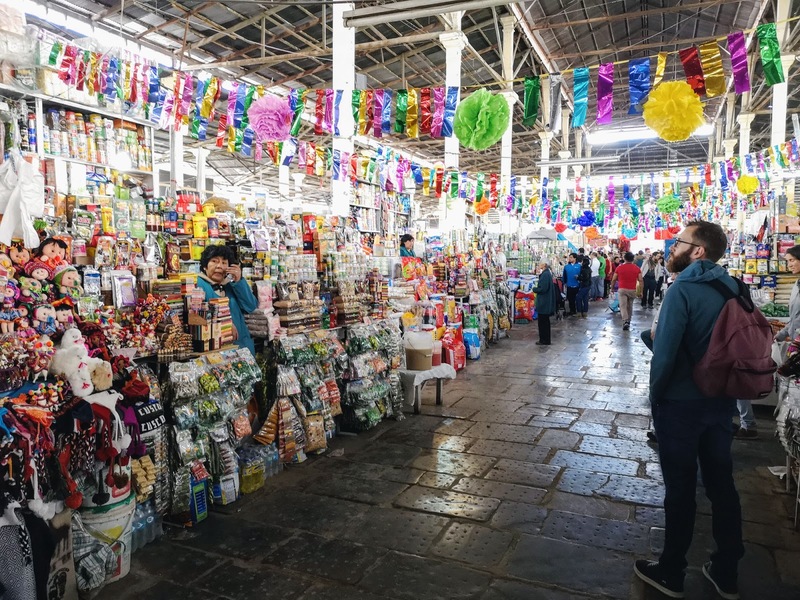 Whilst there are countless stalls selling tourist trinkets, there are also plenty that cater to the Cusqueños too. This can be felt particularly strongly in the food section of the market. There are hundreds of things to be tasted here. Stalls dedicated to cheeses and meat and fish and fruit and vegetables. 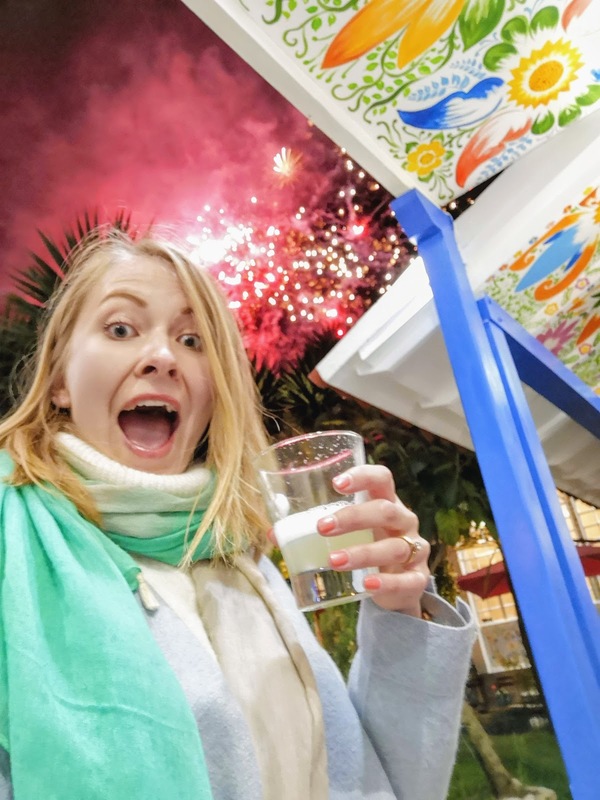 The smells can be overpowering; as I wait for Michele near a particularly pungent sausage stand, a British teenager clamps her hand over her nose, makes a retching noise and says to her Mum "nope, that's it, get me out, get me out, get me out!" and they beat a hasty exit over the wooden planks and doors that make a gangway across the gaping chasms in the market's floor. I can only hope that they didn't notice the women selling plump, bald guinea pigs on sticks from large barrels outside. 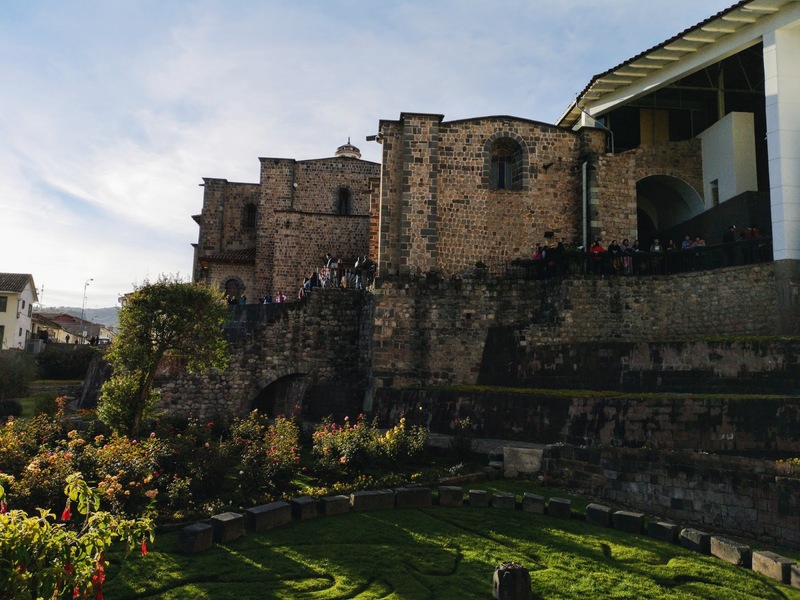 One evening, we manage to slip into Qoricancha just before it closes, where the most important temple of the Inca Empire can still be seen holding up the Catholic Convent of Santo Domingo which was built right on top of it. 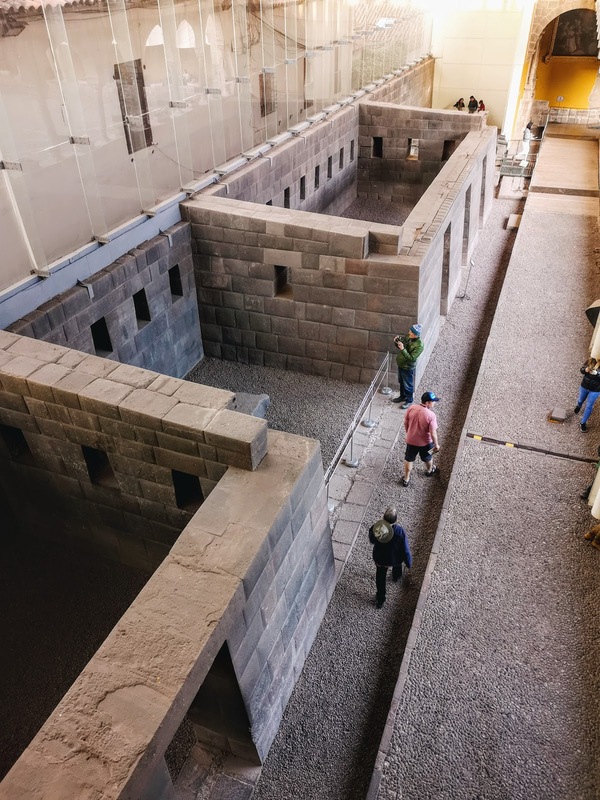 As we walk around, the two structures can be seen bleeding into the walls of each other; parts of the original temple were preserved and used by the Catholics meaning that within the ornate walls of the convent, the exquisitely carved blocks of the Incas can still be found. 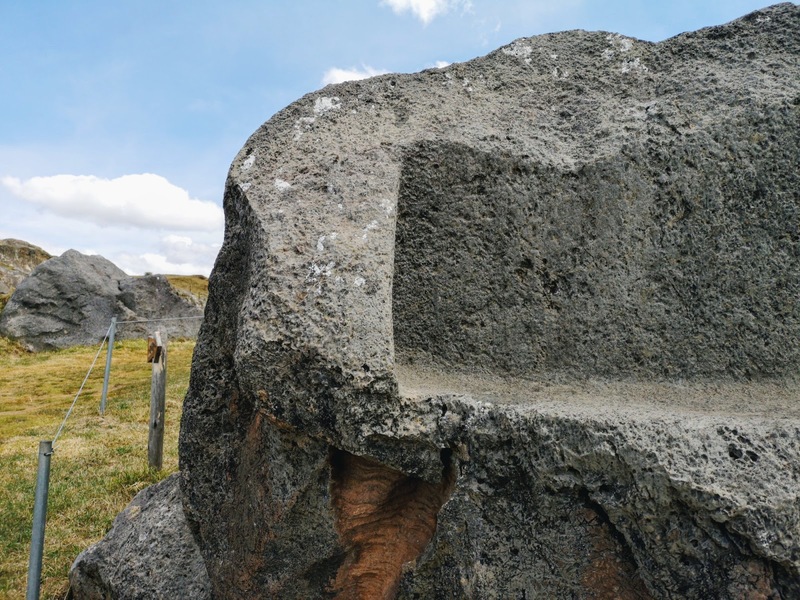 The older Inca structures seem to have survived the centuries better than their younger counterparts. The temple is full of local teens, bunching in the passageways and chattering animatedly. 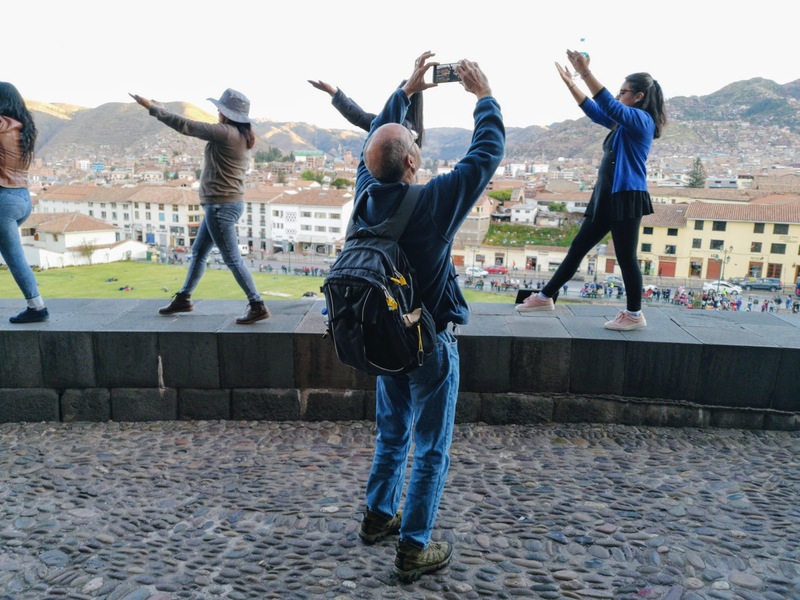 At first it seems as though Qoricancha is the place to spend an evening if you're growing up in Cusco, but soon we notice there is a rhythm and a pattern to their gatherings; they are clustered in particular places between these walls of various ages. 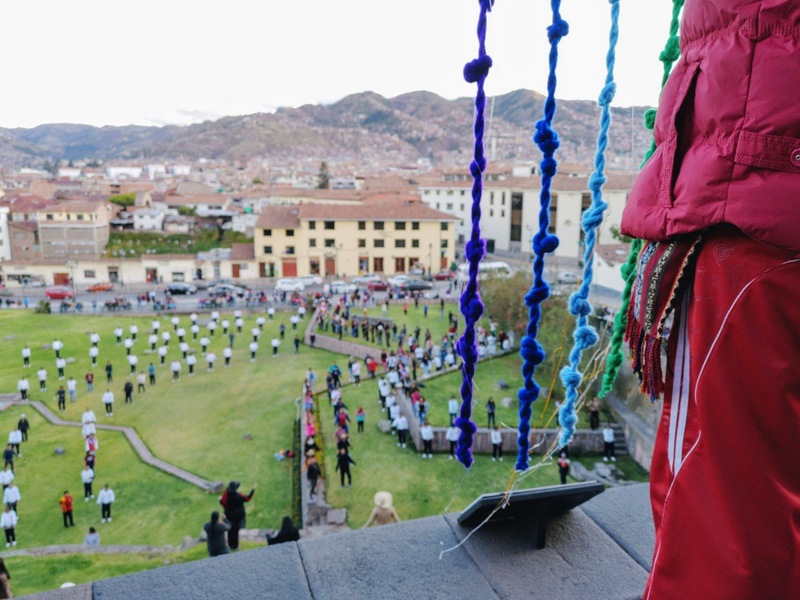 Music begins, drums are beaten and the young people of Cusco begin to flood down from the temple and into the gardens, dancing in a line with a joyful energy. They weave and jump and wave their arms in the air, taking up their positions down in the park below. Soon, a line of people emerges seemingly from nowhere and begins to patrol the edges of the walls, high up on the temple, their arms outstretched in a salute to the sun. Before long, the entire temple and its gardens are a living mass of people on stone. We see this enchanting spectacle twice; once from within the temple and once from the road at the end of the park. It is their rehearsal for the Festival of the Sun on June 24th. It seems a shame to have come all of this way, to have been so close to touching the real Festival of the Sun itself, only to have missed it by mere days. On the 24th of June, we were both not far from Cusco and a million miles away - up in the lofty, mythical heights of Machu Picchu. And indeed, after we have slipped away from watching the last beats of the drum roll through the people rehearsing at the temple, after we have hurried shivering in the cool evening air to our hotel's bar and the happy hour we have promised ourselves, we see a group of hikers returning from the trip we are due to set out on the very next morning. 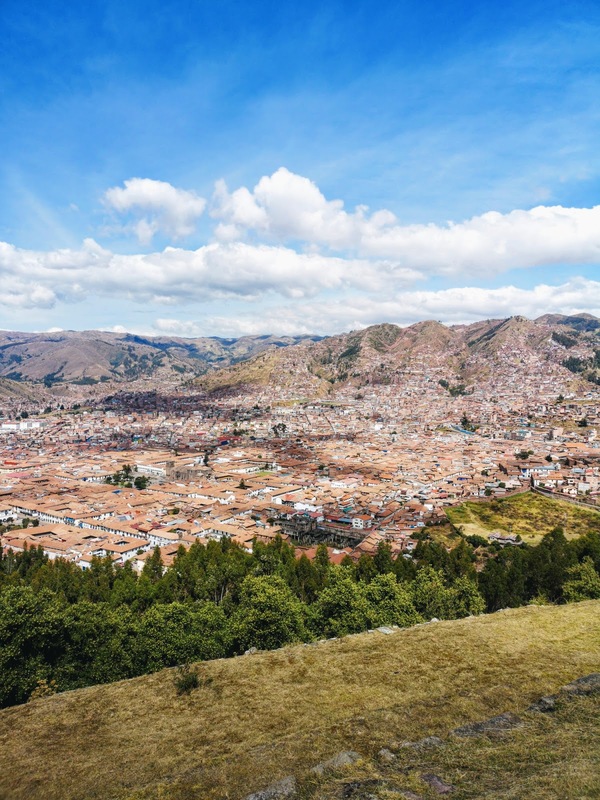 As we watch the hikers from behind the rims of our Pisco sour glasses, dragging their muddy legs and sore muscles with them, fireworks begin to explode over Cusco. 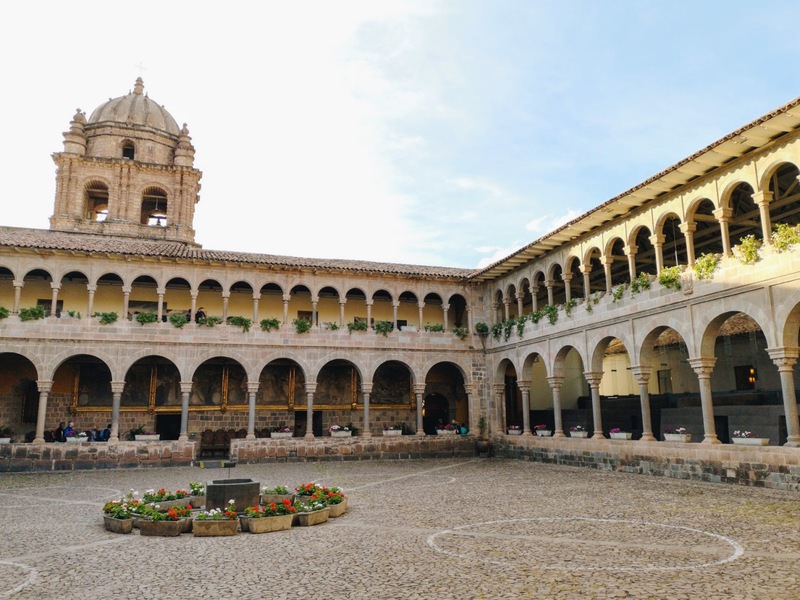 We sit out in the hotel's courtyard and get to talking with a few of them, hear their tales of the adventures that await us as we set off on the Salkantay Trek with MLP. The roof of the hotel frames the fire in the sky, bending around our courtyard and capturing the magic in a perfect square.